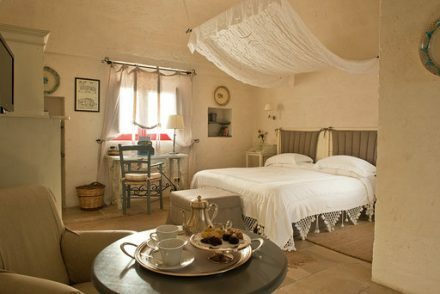 Set just 500 meters from the Adriatic sea, the Italian five star hotel is a beautifully restored 16th century estate surrounded by the ancient olive groves of the Apulian countryside. It boasts an exclusive golf course, a luxurious heated pool and spa, and a private sandy beach club. Its restaurants are welcoming and delightful, taking advantage of the organic produce grown on site. The exquisitely designed rooms and suites, each a perfect blend of rustic elegance and modern five star comfort, invite you to retreat in your own sanctuary. The retreat will include 2-3 hours of group Garuda daily, taught personally by James D’Silva. When not taking classes or enjoying the incredible meals, the guests can visit the scenic white-washed towns of Ostuni, Cisternino, & Martina Franca. Or enjoy the hotel’s private beach club, spa or pool or unwind with a round of golf. The hotel also offers cooking classes and complimentary use of bicycles to explore the estate and the beaches. All bookings are non-refundable so please secure a travel insurance policy.